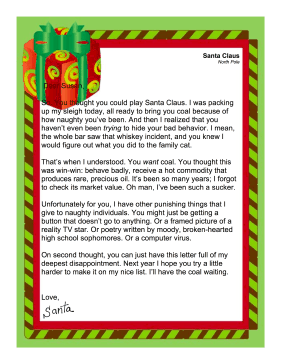 This funny, free Christmas printable is a letter from Santa to a naughty adult. Santa decides that coal is too good for such bad behavior and brainstorms different punishments. So. You thought you could play Santa Claus. I was packing up my sleigh today, all ready to bring you coal because of how naughty you've been. And then I realized that you haven't even been trying to hide your bad behavior. I mean, the whole bar saw that whiskey incident, and you knew I would figure out what you did to the family cat. That's when I understood. You want coal. You thought this was win-win: behave badly, receive a hot commodity that produces rare, precious oil. It's been so many years; I forgot to check its market value. Oh man, I've been such a sucker. Unfortunately for you, I have other punishing things that I give to naughty individuals. You might just be getting a button that doesn't go to anything. Or a framed picture of a reality TV star. Or poetry written by moody, broken-hearted high school sophomores. Or a computer virus. On second thought, you can just have this letter full of my deepest disappointment. Next year I hope you try a little harder to make it on my nice list. I'll have the coal waiting.